To the west of Denpasar and the Kuta/Seminyak areas is mainly a sprawl of rural villages though there are some really nice temples and beaches that are worth a visit and away from all the crowds. 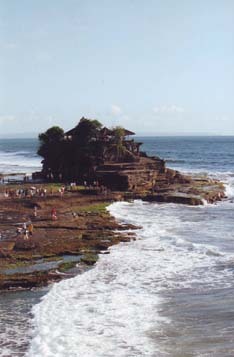 Tanah Lot is one of the most famous temples in Bali and is believed to date back to the 16th Century. Yeh Gangga Beach, just further west from Tanah Lot is a quiet beach surrounded by villages and rice fields. At Yeh Gangga Beach you'll find Bali Island Horse stables where you can go horse riding on either the beach or through the villages and rice fields. Located 35kms west of Denpasar and 7kms north of Tabanan is the Taman Kupu Kupu Bali Butterfly Park. Open everyday from 8am to 5pm they have on display butterflies from all over Bali including the giant Birdwing Butterfly. They have a conservation breeding program and butterflies are released every morning. West Bali National Park is located in the northwest corner of Bali. Established in 1941 the park covers an area of over 70,000 hectares, made up of arid forest and mangrove swamps. Within the National park are several mountains - Gunung Merebuk (1394m) Gunung Mese (1210m) and Gunung Bajra (1077m). The park contains a variety of animals including barking deer, anteaters and giant squirrel. The rarest of the animals is the endangered white Bali starling. There is now a breeding centre in the park actively trying to increase the population of the birds. Trekking is possible in the West Bali National Park. You first require a park permit which you can get from a PHPA office either in head office in Cekik, or in either the Labuhan Lalang PHPA office and Denpasar office. Price for the park permit is 2500Rp per person. Treking guides will cost around 150,000Rp for a 2 hour trek or up to 400,000Rp for a 7 hour trek. Located at Tabanan, located 30km west of Denpasar, are the Yeh Panas Hot Springs. A hotel has been built up around the hot springs offering therapeutic bathing in the volcanic sulfurous waters. Around this area are some beautiful terraced rice fields. Legong Keraton Beach Hotel located on Berawa Beach between Kuta and Tanah Lot. Room rates from US$80 low season and US$90 high season plus taxes, including American breakfast. For accommodation close to the West Bali National Park see our Menjangan page.